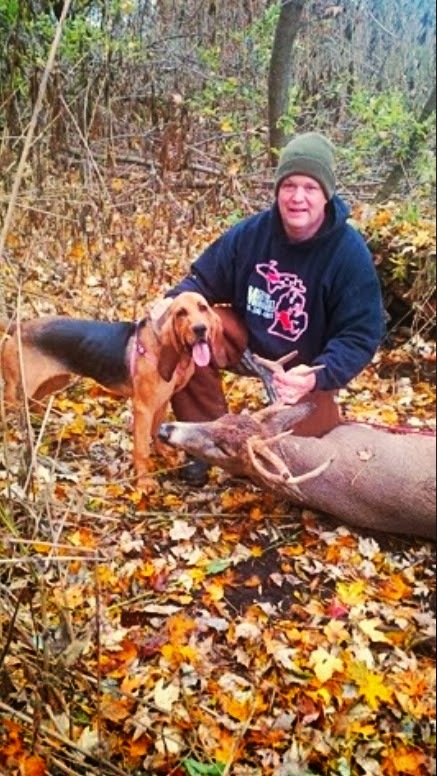 MICHIGAN DEER TRACK'N HOUNDS LLC Michigan's Professional Deer Blood Tracking Dog Services: Blood tracking dogs. 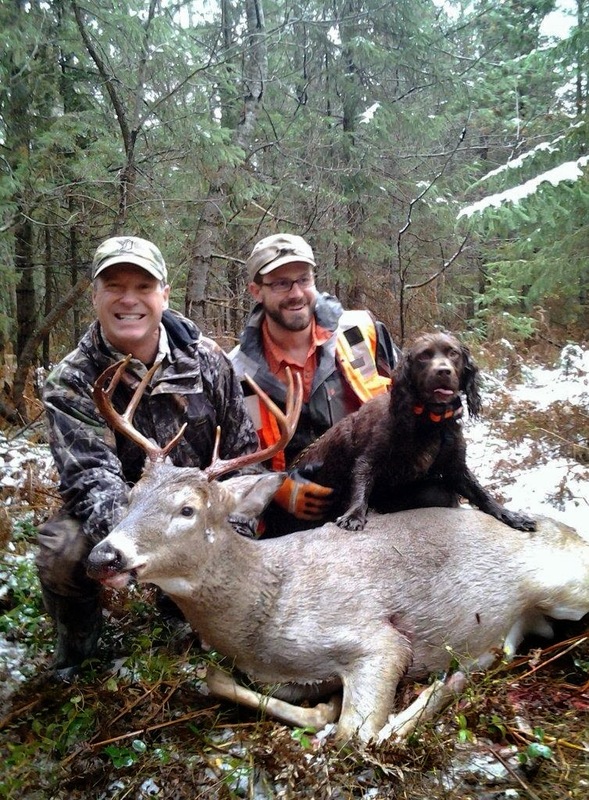 Blood tracking dogs or deer tracking dogs or scent trailing dogs. You can call them what ever you want, you may or may not believe that a trained scent trailing dogs can track a day later scent trail (24 hours old) or even after it has rained. Well today (10/7/2012 Sunday) I drove down to Albion Mi. 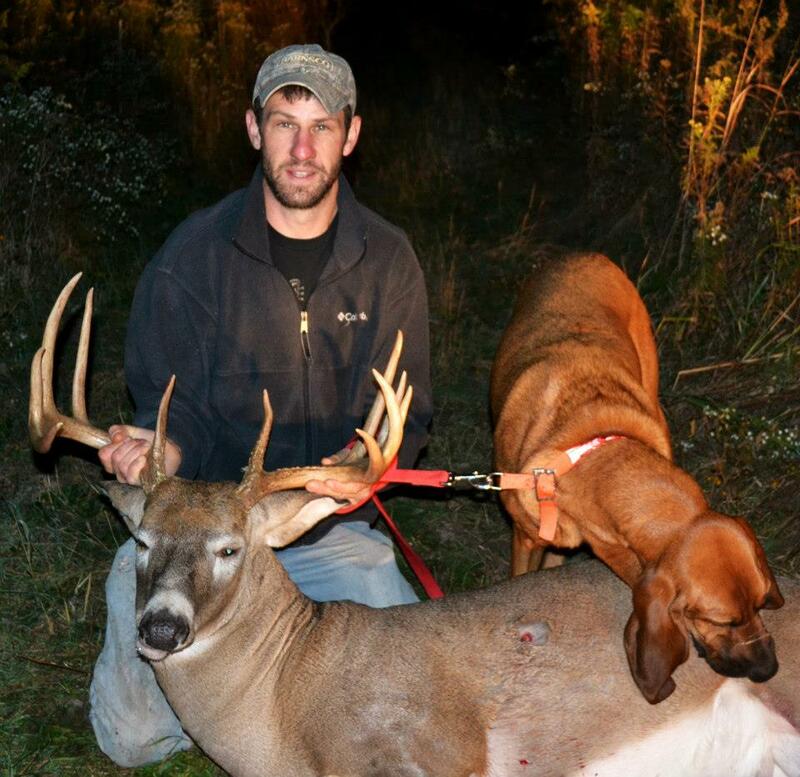 near the Kalamazoo river to blood trail deer, scent trail a wounded 31/2 year old 8 point buck. Bill shot the 8 point with a crossbow and his bolt was tipped with a 2 blade rage. Bill made the quartering way shot at 17 yards. The bolt blew right the buck and he watched the buck blast away. Bill"s friend Matt was sitting a few hundred yards away and just before dark he noticed a nice 8 point coming running right by him. Matt was able to see both entry and exit holes. He noticed a large gaping hole up high on the bucks rights side and at mid level hole in front of the left leg. Matt thought he was going to watch the buck fall over and then all the sudden the buck took off running again. Bill and Matt started blood tracking the deer near Matt tree stand and they were able to follow the blood trail for a couple hundred yards and lost the trail near the Kalamazoo river. I started Sypris at the shot site and thats where found the running hoof prints and 50 yards later we started seeing a few drops of blood and Sypris followed the bucks path all the way to the spot Bill and Matt started blood tracking. The buck went .74 of a mile at the point he passed by Matt tree stand. Once Sypris made it to the last blood she turned left and tracked up to the bank of the Kalamazoo river and she started whimpering (indicating the buck crossed the river) so I stripped down to my skibbies and crossed the river and Sypris followed by swimming the river. I got dressed and off we went. Sypris picked up the blood trail on the other side of the river. 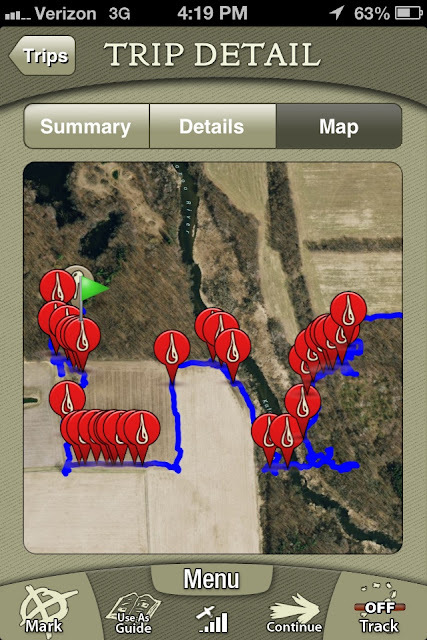 We ended up tracking 1.94 miles and we called it off once the buck crossed a cut cornfield. We had blood transfer at the edge of the cut cornfield confirming Sypris work. The scent trail was 21 hours old and it rained for about 1 hour before my arrival and it was still sprinkling while tracking. Even tho we did not find a dead buck it was still a successful track and the hunter got closure knowing his buck is not just dead somewhere. I made a believer in Bill and Matt. The track starts at the green flag and ends at the red flag. The red dots are spots i found blood.